I shouldn’t even have to elaborate on why this is a downright TERRIBLE idea, but I’m going to anyway because clearly some of the simple-minded folk that are backing this turd of notion don’t seem to understand that this is likely not going to have the effect they think it will. I’m guessing they assume that judges’ scores being weighted more heavily = good dancers stay, bad dancers go. But apparently they don’t realize that the judges aren’t exactly infallible & objective – far from it, as we’ve witnessed over 17 seasons. The judges are capable of some pretty blatant favoritism towards some contestants (William Levy, anyone?) and have undeservingly HOSED other contestants (Ralph Macchio fans, this is where you nod in agreement). They also have a tendency to “pity score” some contestants to soften the blow (*cough*BRISTOLPALIN*cough*), with the unexpected effect of said contestants outstaying their welcome. And then there’s their personal biases: Carrie Ann & Bruno are both easily swayed by attractive young men (regardless of how well they can actually dance), while Carrie Ann seems to turn into a green-eyed monster when it comes to scoring attractive young women, and tends to take some cheap shots when critiquing them. Len has a tendency to scold Derek at least once a season, and hand out an absurdly low score as a result. And of course, Carrie Ann’s dubious lift-policing seems to have an effect as well…just ask Corbin & Karina, who earlier this season were penalized for a lift that didn’t even exist. We’ve also talked about the “man behind the curtain” possibly exerting some influence over the judging as well – seemed awfully convenient that William Levy was getting worshipped by the judges week after week (whether or not he was actually worthy of the worship), when he was set to launch a huge deal for Univision (which is part of the ABC family…hmmmm). People REALLY want to give these clowns even MORE power? I feel like just last year, people were complaining about how the judges were terrible and needed to be replaced!!! Another point to consider: the viewers need to feel invested in this show – they need to feel like they have a say in who stays and who goes. And the minute you start making them feel like their vote doesn’t count or counts less is the minute you start losing viewers. Even those that don’t always vote seem to take comfort in the fact that the viewers do have the power to overturn a bad score from the judges. Really Stupid Idea #2: Eliminate the viewer voting altogether. This is quite possibly the worst idea I saw, and it’s terrible for all the same reasons I mentioned above plus the fact that IT REMOVES THE EXCITEMENT AND TENSION OF AN ELIMINATION. With this format, the low scorer of the evening will get their walking papers – and if that person dances early in the show, it’s pretty easy for viewers to deduce that they’re going home, and will likely tune out. Hell, it would probably be pretty easy to predict right off the bat who’s getting sent home, without even seeing anyone dance, just based on the judges’ scores and behavior the previous week. The show needs to have an element of shock and surprise in order to keep viewers tuned in – take that away, and you basically just have a show that is completely predictable, and thus not very exciting. Keep this in mind, too – if a couple that dances well all season has just ONE off-night, they could be headed home, based on judges’ scores alone. The viewer votes do allow the viewers the opportunity to “save” a couple if they’ve just had a bad night. Leaving it up to the three stooges to determine who goes home each week is a very, very risky bid, and this show needs the viewer voting element to maintain both viewer investment and some degree of suspense on the show. Really Stupid Idea #3: Only allow inexperienced dancers on the show. I always knew those High School Musical kids were rotten to the core. 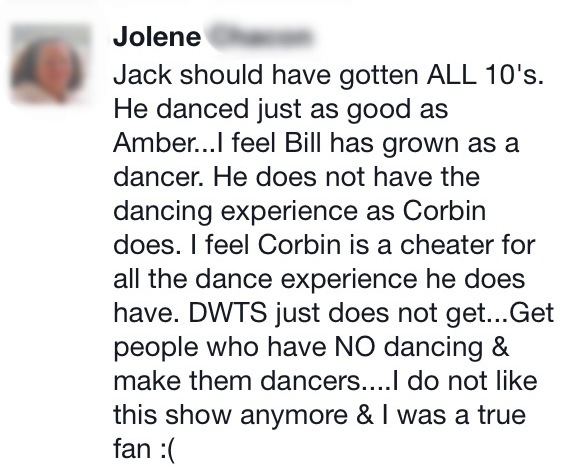 I bet Corbin’s also taking performance-enhancing drugs to help him on DWTS, too!!! Good luck with that one, considering most celebs have done at least a little bit of dancing in their lives – be it jazz & tap lessons when they were a kid, or a movie role that required dance lessons, or even dancing in the endzone after a touchdown. This idea seems to come from some members of the pro-Bill/Leah/Jack camp, who seem to think the show is “all about the journey of inexperienced dancers” and try to argue that “it’s not fair to have anyone with dance experience on the show” – and by extension, they think dancers like Christina, Snooki, & Elizabeth deserved to go home, since they believe they shouldn’t have even been there in the first place. I have always been of the opinion that it’s good to have a mix of both experienced & inexperienced dancers on the show – it pleases both the camp that loves “the journey” and the camp that just loves great dancing. Having a ringer or two each season seems to ensure that you’re going to see some fantastic dances; and having a trainwreck or two that works hard to improve leaves room for improvement and gives viewers an underdog to root for. Really Stupid Idea #4: Only allow good dancers on the show. Really Stupid Idea #5: It’s all Bill’s fault that better dancers have gone home. I know, right? How dare he make people like him enough to vote for him!!! 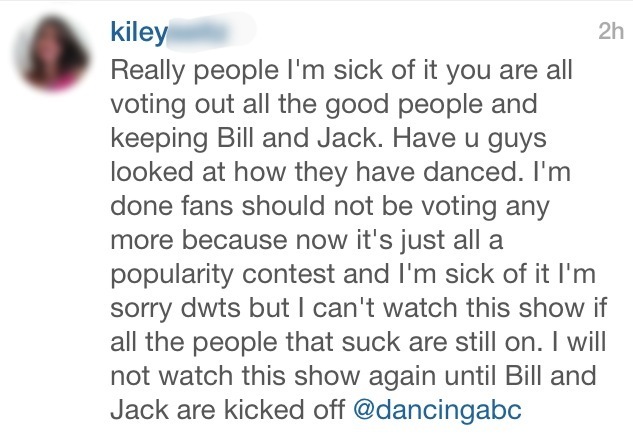 Really Stupid Idea #6: The show should strictly be a dance contest…not a popularity contest. What’s a “compatision”? Is it kind of like twerking??? 18 responses to "PureDWTS Season 17 Rant: Really, Really Dumb Ideas About the Show (Courtesy of Facebook & Instagram)"
Just excellent Court! Good job! And the “Blame Bill” or “it’s Bill’s fault” excuses are the ultimate. So stupid! Oh gosh, I was laughing at every single one of those comments. First off, if people really want to fully see “good dancing” and only allow “good dancers” on the show then they need to go watch SYTYCD. Remember season 14 when they had the dance-off and the judges decided who went home between the bottom two, UM NO. It didn’t work then and it wouldn’t work now. I used to go on the forums on ABC to read peoples thoughts before I found Pure and I had to make myself not read it after awhile because some of the things people say are just cringe worthy. Especially, last season. The Zendaya fans were SO annoying on social media (and to an extent – still are). It’s amazing to me how…what shall I say – lacking in understanding?…people are about this show and how it works. And it’s not just people on social media – some of the articles on various sites are just as bad. I was just reading a piece/photo gallery (maybe on msn.com?) about the four finalists, and their best and worst dances. They said Corbin’s Game of Thrones waltz was his worst dance, and that it was poorly executed. Really?? That wasn’t poorly executed, and it wasn’t his worst dance; the judges just didn’t like it, so perhaps it was his lowest scoring dance – but it wasn’t his worst. People apparently believe that if the judges say something, it *must* be true – and we know how ridiculous that is (as pointed out so eloquently above). I’m so happy that we have this site for intelligent discussion and commentary (including this article) – so thanks, mods! Loved, Loved this post. On the bright side, while we may be blunt on this site, we still have brain cells, which in many of the tweets you described does not make me believe these people’s synapse were not firing correctly. And may I just get down and ugly for a moment….compatision…..oh dear. Giving the judges more weight in the scoring is down right scary. Wasn’t it just week before last that Len called Elizabeth his favorite dancer…that is just inappropriate because judges should try to be impartial..and I am confused anyway, because the scores this season have been so high. I think they have been artificially high in some cases. I actually took a short trip into “lion’s den” again and it saddens me that people would actually vote for someone they know “isn’t the best dancer, but at least isn’t Derek.” Are you kidding me? What he has done this season is spectacular! Oh well life goes on. It sure does seem like it has been a short season this fall! LOL Jim! You said it! Kudos for blurring out parts of the names and all that… at the end of the day, people have opinions. Although… idea #4 is just mind-boggling. For all the wrong reasons. @Courtney – We should make this “Dumb Ideas” column a must have each season!! I thoroughly enjoyed it. LOL! Thank you much for this Courtney! Love it. I laughed at every stupid idea entry. And your brand of snark is truly admirable. I’m so glad you came up with this. Been missing the cheese awards lately. Thanks Courtney, that was fun. (ROTFL) I don’t go on the other sites, so thanks for letting us see what is out there. I will say as frustrated as I get with DWTS sometimes I still love it, and understand at the end of the day it’s just a glittery dance show. Compatision.. is that like constipation? I had a really bad week but god this so made up for it!!! 🙂 When I read the boards or faceboook my head starts to hurt. I swear some dancing fans don’t have any common sense. Just wondering is there any inside about the freestyle dances? Loved this Courtney! You put into words what a lot of us have been thinking. I love reading everyone’s comments, even if I don’t agree with them. At least here, for the most part, we respect each others opinions. I know there are those that get deleted. When I found this site, I didn’t know what was considered good or bad ballroom dance and since then I’ve learned a lot. Thank you to all of you that work so hard to keep this site going. I appreciate it. I love this post. 🙂 It’s just awesome. My only one concern about DwtS is the judge’s scores inconsistency. “Compatision” … Oh dear God, America….